" Parisian spirit and charm in the heart of international fairs "
Ideally located at 200 meters from Porte de Versailles exhibition Center, UNESCO, Palais des Sports and just a few minutes to the Eiffel Tower and Montparnasse railway station. The Versailles Hôtel offers 41 rooms decorated with charm and all equipped with bathroom or shower, direct phone, modem plug, satellite TV, mini-bar, hairdryer. 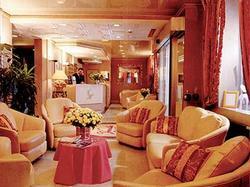 It also proposes different facilities : laundry and conciergerie service, and private boxes.